David Gutman and Lee Cooper will receive an NCI award. Two Winship researchers will receive a $3.5 million Informatics Technology for Cancer Research (ITCR) U24 award from the National Cancer Institute. 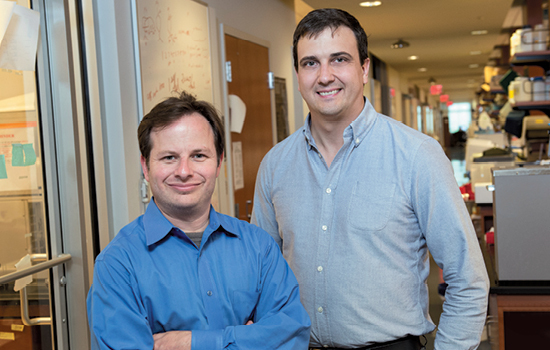 David Gutman and Lee Cooper, assistant professors in the Departments of Neurology, Biomedical Informatics, and Biomedical Engineering, will use the five-year award to develop software tools to help researchers gain new insights from cancer imaging data. The award will set the stage for novel applications in human cancer research, both at Winship as well as for the cancer research community as a whole. ITCR awards are intended to build tools to address the growing number of "big data" problems impeding cancer research. "All areas of medicine are experiencing an explosion of data, but this is especially true in cancer," says Cooper. "Transforming cancer data into knowledge that can benefit patients is one of the major challenges facing cancer researchers today."